This could become America’s new luxury halo car - providing it enters production. Shown in a series of conceptual renders, the design takes its cues from Art Deco cars from the 1930s with a modern twist. Its massive 22-inch wheels and large vented hood give it a menacing presence, as do its dimensions. 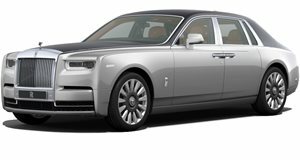 With a wheelbase of 134-inches, it’s longer than a Rolls-Royce Phantom. Among the Manhattan's luxurious features include a glass roof panel, brushed stainless steel accents and side body vents. To match its monstrous proportions, Godsil is planning to fit the Manhattan with a 13-liter, V16 engine that produces 1,000 hp and runs on natural compressed gas. Don’t hold your breath about seeing a production model any time soon, though. The Godsil Manhattan was initially announced in 2013 and originally meant to start production in 2014. These new renders provide a fresh look at Godsil's vision while he looks for investors to help make the Manhattan V16 a reality. Godsil now estimates that we’ll see a prototype of the Manhattan within a year before it enters production by the end of the decade. Should it be successful, a sedan, SUV and mid-engined supercar will join the line-up, all powered by the Manhattan’s natural gas V16 engine.